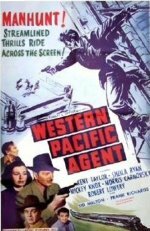 Despite its title, Western Pacific Agent is a contemporary crime melodrama. Kent Taylor stars as a railroad detective, assigned to track down an elusive robber-murderer. The audience knows from the outset who the culprit is (hotheaded Mickey Knox, who delivers an astonishingly vicious performance), but the plot requires the detective to methodically piece together the evidence before making his final move. Helping him solve the crime is the sister (Sheila Ryan) of a slain paymaster (Robert Lowery). The whole story is narrated in flashback by an uncredited Jason Robards Sr. One of the most brutal films of its era, Western Pacific Agent spares the audience nothing: at one point, the villain beats up his own father!